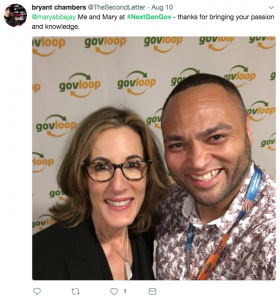 Couldn’t join us at the Next Generation of Government Training Summit earlier this August? As much as we wish every single govie could join us at the Summit here in D.C., we know that expectation might be a little high. However, we wanted to share some of the highlights from this year’s Summit with our entire community. Check out session recaps below as well as some social posts from our awesome attendees! How to Be Good at Life:Captain Deshauna Barber shared some of her own personal struggles and setbacks and explained to our attendees how being the best version of yourself will help you “be good at life” and succeed in your goals. 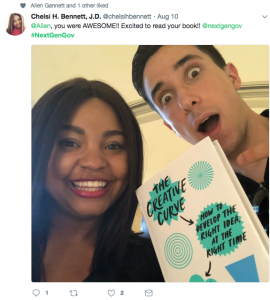 How to Create Intentional Innovation: TrackMaven CEO, Allen Gannet explored our existing notions of creativity but also shared his thoughts on how we can all learn to harness our creativity and even cultivate it, rather than just waiting for it to happen. Become the Hero of Your Career: Dr. Elizabeth Kolmstetter, a veteran public servant and current Director of Talent Strategy and Workforce Engagement at the National Aeronautics and Space Administration (NASA) explained why government employees who feel stuck in the professional doldrums should never fear – everyone has the potential for career heroism within themselves. How to Break a Negative Culture Cycle: Chris Armstrong, Culture Executive at National Geospatial-Intelligence Agency, discussed the idea of “collective cultures” in the workplace and how they contribute to a negative atmosphere, and also shared insights on how to overcome this. 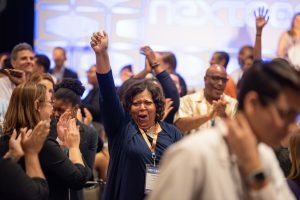 In addition to all the great speakers and sessions, NextGen was a success because of all the amazing public servants who joined us for the two-day Summit. 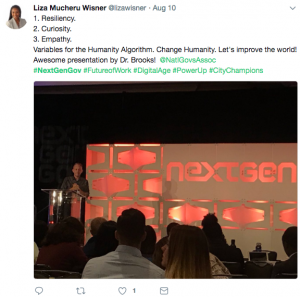 Here are some of their highlights and also be sure to check out #NextGenGov on Twitter and Instagram.